New results from NASA’s Van Allen Probes show that the acceleration energy is in the belts themselves: particles inside the belts are sped up by a local kicks of energy, buffeting the particles to ever faster speeds, each kick acting as a perfectly timed push on a moving swing. Knowing the location of the acceleration will help scientists improve space weather predictions, since changes in the radiation belts can be risky for satellites near Earth. The results were published in Science magazine on July 25, 2013. The discovery that the particles are accelerated by a local energy source is akin to the discovery that hurricanes grow from a local energy source, such as a region of warm ocean water. In the case of the radiation belts, the source is a region of intense electromagnetic waves. "Until the 1990s, we thought that the Van Allen belts were pretty well-behaved and changed slowly,"
says Geoff Reeves, the first author on the paper and a radiation belt scientist at Los Alamos National Laboratory in Los Alamos, N.M. "With more and more measurements, however, we realized how quickly and unpredictably the radiation belts changed. They are basically never in equilibrium, but in a constant state of change." In order for scientists to understand such changes better, the twin Van Allen Probes fly straight through this intense area of space. When the mission launched in August 2012, it had as one of its top-level goals to understand how particles in the belts are accelerated to ultra-high energies. With two spacecraft taking simultaneous measurements with advanced technology instruments, the Van Allen Probes was able to distinguish between two broad possibilities on what speeds up the particles to such amazing speeds: radial acceleration or local acceleration. In radial acceleration, particles are transported perpendicular to the magnetic fields that surround the Earth, from areas of low magnetic strength far from Earth to areas of high magnetic strength nearer Earth. The laws of physics dictate that the particle speeds in this scenario will increase as the magnetic field strength increases. So the speed would increase as the particles move toward the Earth, much the way a rock rolling down a hill gathers speed simply due to gravity. The local acceleration theory posits that the particles gain energy from a local energy source more similar to the way a hot ocean water spawns a hurricane above it. Reeves and his team found they could distinguish between these two theories when they observed a rapid energy increase in the radiation belts on Oct. 9, 2012. The observations did not show an intensification in energy starting at high altitude and moving gradually toward Earth. The challenge for scientists now is to determine which waves are at work. Such a task will also be helped along by the Van Allen Probes, which were also carefully designed to measure and distinguish between the numerous types of electromagnetic waves. APL built and operates the twin Van Allen Probes for NASA. 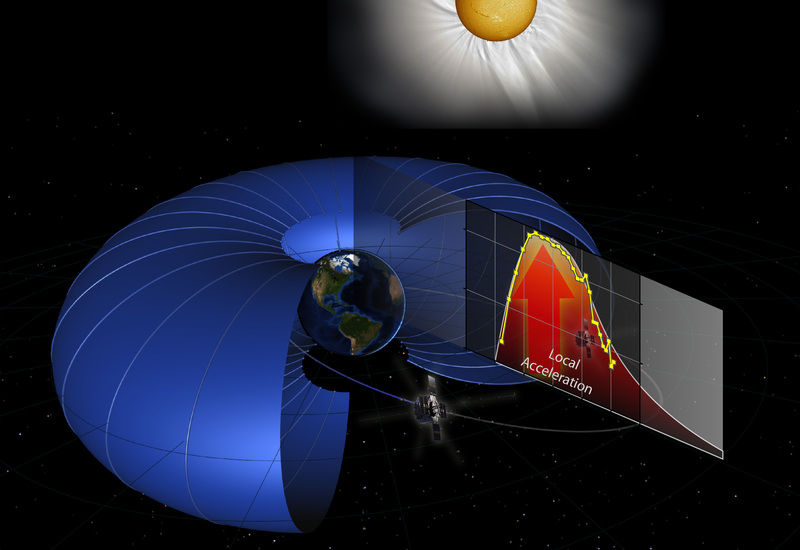 The Van Allen Probes comprise the second mission in NASA's Living With a Star program, managed by Goddard, to explore aspects of the connected sun-Earth system that directly affect life and society.